The actor Karl Urban is from New Zealand and his latest movie Dredd – based on the comic Judge Dredd – looks promising. I bet you didn’t know that Tofu was originally offered the part but turned it down due to other commitments. He was a bit disappointed but these things happen. 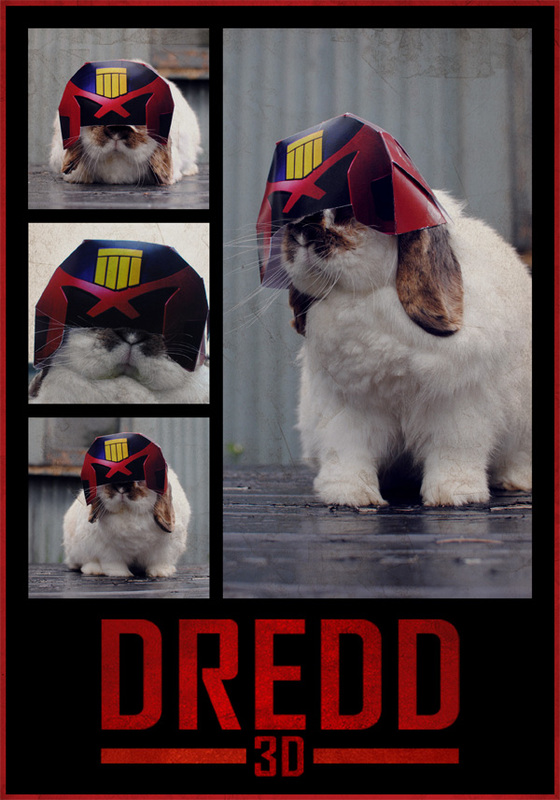 To cheer him up, The Koala and I fashioned a bunny sized Dredd helmet out of some card. What do you think? GG the Wonder Hound sounds like a colourful character with great stories. I bet he’s a hit with the ladies too. Well he certainly has the chin for the role! But I guess it would’ve been hard to frame the shots because of the height difference with Olivia Thirlby. You may be onto something there, perhaps a custom wooden plinth may have worked? Poor old Tofu, I feel his embarrassment! He really would have been perfect for the role. The hat is pretty sweet though. I keep meaning to get one of those tiny Mexican hats off of the tequila for Flatpac. Haha. Bunnies in hats.